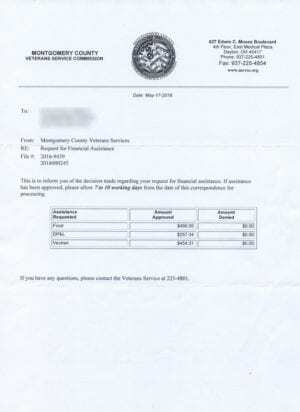 On May 12th- my office manager took our homeless veteran down to Montgomery County Veterans Services to ask for financial assistance. This was after we had to supply yet another 90-day transaction history of bank account, which had been closed and written off for a $71 overdraft. He was literally penniless, homeless (sleeping on my couch), without a phone, a car (and he’s a pizza delivery driver), and working 3-4 hours a day doing prep at a pizza shop for the last week after coming out of an extended hospitalization. They were very helpful, paying off his old utility bills so we could get utilities turned on in his new apartment that I was going to have to front the rent and deposit and co-sign on, since St. Vincent DePaul had erroneously claimed he was ineligible for SSVF (Supportive Services for Veteran Families). They were generous- they decided to give him $485 in food assistance, which happens to be equivalent to the first month’s rent. That was due on May 13th, the day I had to sign the lease. Let’s see, we pay 5 commissioners almost $10K a year to oversee an organization of 9 people supposedly there to assist vets, all making more than the amount of cash assistance a week- and we can’t cut a check immediately for $485 and hand it to him? And note, when they were writing the check, I was setting up a new bank account at Wright Patt Credit Union for him with his first big 2 week paycheck- $135, of which we were able to deposit a whopping $80 because he had to pay some co-workers back money he had borrowed while in the hospital. The saddest thing- after this whopping grant, he’s only eligible to come back one more time this year to ask for help. They have a limit of 2 requests per year. They turned down requests for rent, deposit, cell phone allowance, car. They turned down paying the water bill he stuck his former landlord with because the landlord had it in his name (I’m not feeling so bad about that one). But- the question is- for this investment in manpower and management, why can’t we have a veterans’ assistance program that can have the authority to cut a check for at least $2,500 on the spot? Why did we have to keep supplying additional records (our packet was literally an inch thick), to even get in the door? Why did no one from MCVS reach out to us to help out with processing him for other benefits after my scathing blog post on Sunday? The VA Chief, Glenn Costie was in touch with me Sunday afternoon- and by Wednesday, my arguments for the Veteran’s status had been escalated to Atlanta and DC and validated- he is qualified for SSVF. I was just interrupted from writing this by a call from Herb Davis, director of MCVS. We, Jen and I, just had a 30-minute discussion about our experience. We’ve been invited to speak to the entire board. We questioned how you can call a check as much as 20 days out “emergency food assistance.” We asked why when paying off the old utility bills, was no offer made for future bills, nor was he offered help in applying for PIP (a program for paying utilities for extremely low-income residents). No one offered to begin his application for Veterans’ Benefits either. Mr. Davis admitted and accepted his office’s failings. He still relies on “processes and procedures” as reasons for their lackluster performance. Sending our Veteran out to get PIP on his own, without a phone- is kind of like sending someone out to fish, without a pole, hook or bait. I think right now- the answer is, we’re here to give you a piece of paper for the rights to a fish, at a later date. Next Post: Measuring the wrong damn thing. Valuing the wrong measurements. The MC Common Pleas Court pays jurors in cash through an ATM. The money is from the same source (Auditor/County Budget). Why can’t Veteran Service do the same?? @Carl- good idea, I’ll ask the same question. and- of course, it will be mailed later. A big thank you to Scott Sliver and the Hope Foundation food bank- which got food in his hands the night before he moved in- and to the Blue Star Mothers- who supplied him with a ton of food- and to Paulletta Gwinup of http://www.dragonsgate.garden who dropped off a bunch of easy to cook canned goods. The check came today. Great. OHJDFS sent a 7 page letter saying he was qualified for emergency food assistance. The card, no where to be seen. Another winner. Bubba- you get special leeway- but, I’m thinking it’s time to change your name to Mama Jones. We’ve made some progress- but, we’re still working way too hard to do their jobs. Hopefully, someone is going to look at this and think- “wow, if Esrati and Jen had to go through all this- our system isn’t a system that’s working” – and they’ll ask- flat out- some of which Herb did yesterday. We want this to work in the future. then we’ll have made some progress- that’s what an advocate should do for the veteran.